It was the clearest of signals in that first week of October 2018. The Dow Jones Industrial Average, S&P 500 and the Nasdaq Composite all could be labeled as having five complete waves at multiple degrees of trend, signaling the top of a 200 year bull market. The importance of the signal is that, if the labeling is correct, this top, unlike the tops in 2000 and 2007, is far more serious and portends a much deeper, longer lasting bear market than anything anyone alive today has experienced. 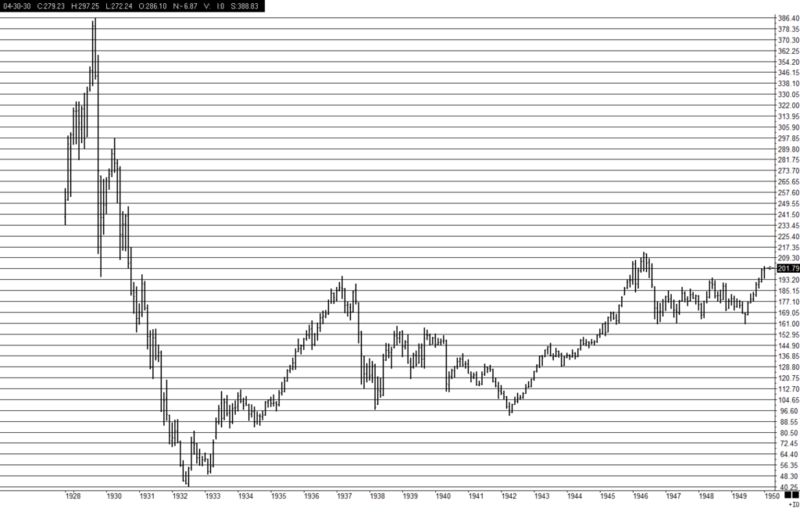 It should be a degree of magnitude greater than the Supercycle Bear Market of 1929-32. This one is expected to be a Grand Supercycle Bear Market. The previous one began in 1720 and the effects lasted nearly fifty years. This bear market began right on schedule, dropping in two crashes with an intervening countertrend rally into a low on Christmas Eve. What should have followed was another upward reaction, followed by a further drop into a low of around DJIA 15,000 to complete the first leg down in a drop that is expected to get below 4,000. Then, after a retracement that could last a couple of years, another impulse wave taking the Dow down below 1,000 to a final low, probably 10-15 years from now. Instead, an advance began on December 26th that has gone beyond a normal retracement, so the pattern is now something other than an impulse wave. From here, I believe there are two possibilities. The bear market may continue irregularly in the way that the decline from 1986 to 1970 occurred. The problem with that scenario is that the 1986 drop was not a major bear market and it only dropped 37% before coming back to new highs. The second possibility is that this first drop is another pause in a continuing bull market which would mean new highs are ahead. The next phase of decline should give us a clue, and it shouldn’t take long to get underway, as the market is very overbought now. How does an investor handle the situation? I look at the market now in terms of risk. It is the same as it was last October. It is extremely overvalued. Most investors have no real idea what they own, and are numbly complacent about it. A rational study of the present market condition clearly indicates that the risk, in historical perspective, has never been higher. Unfortunately, investors are never rational at market tops. They unconsciously cling to their stocks, driven by FOMO (Fear-Of-Missing-Out). It’s a hard emotion to beat. The investment advisory industry is similarly bullish. Surveys of economists consistently indicate they are nearly unanimously optimistic. As counter intuitive as it may sound, major market turns always take place when the majority thinks a trend will continue. In the futures market, the Commodity Futures Trading Commission’s Commitment of Traders Report on futures on stock indexes indicates a record long (bullish) position on the part of speculators, and a correspondingly record short (bearish) position on the part of the commercials. When extremes like these are reported, it is always the commercials that are right. As long time readers know, I do not make recommendations. How you handle this information is your business. But I will tell you that my recommendation to Cindy is that she remain in 2 year Treasury Notes, even if the market were to go to another high. History tells us that you can’t make money in an expensive market and the risk today, in my opinion, is extraordinary. The US stock market continues to track the start of the previous Supercycle Bear Market, which occurred in the final two months of 1929. Looking ahead, I expect more high volatility in both directions until the first wave of primary degree of trend bottoms at around 15,000 in the Dow Jones Industrial Average, which should come in by mid January. Now would be a good time to get a handle on why I was able to accurately convey the forecast for a severe collapse in the market when virtually every analyst in the financial services industry was bullish in the extreme. It was certainly not brilliance on my part. Rather, I rely on a method that, while challenging in it’s application, provides a genuine result because it is based on what influences investment behavior. Conventional market analysts attempt to assign exogenous causes for the direction of markets and are consistently wrong at major turning points. The result is that, sooner or later, they wreak havoc on the investment community by insisting on using bad science in their approach. The primary task in investing is to avoid being a sucker in uncertainty. We don’t know what is going to happen next in the market, so we seek the advice of “experts.” We do not, as a matter of rule, bother to check the error rate of an advisor’s method. The fellow wears a good suit, sounds plausible and, most importantly, we want to invest or we wouldn’t be in his office to start with. There is a reason we want to invest: social mood is elevated. The more elevated, the more eager we are to invest without doing much in the way of due diligence. If the market has been going up for a few years the advisor’s results are good and his clients have no trouble recommending him when a friend inquires. When the market turns, everyone, especially the advisor, is shocked. That’s the situation today. What will follow is an attempt on everyone’s part to justify not selling and to hang on until the losses get too much to bear. eventually the crowd sells and most will never want to invest again. The long term forecast given by the Socionomic Theory of Finance is for the US stock market to whipsaw through several large swings over the next twenty years or so. When the first swing down bottoms, most likely in January 2019, a good, tradable countertrend rally should recover some of the loss and top some time in late spring or early summer. After the countertrend rally, a long, devastating resumption of the bear market should take the market down to an incredible low with the Dow bottoming around 3,000 sometime in 2021-21. From that point, a huge rally that may take stocks up as much as fifty to seventy percent of the total loss will provide us with the best opportunity those of us alive today will ever have to make money in stocks, because after that advance the market should turn back down to its ultimately low below Dow 1,000. The next twenty years in the market will be bewildering to most advisors. They were exceedingly optimistic at the top we just past. They are now becoming bearish. When we hit the next low in a few weeks they will have turned very bearish just when Socionomics offers a good short term trade. Then, come summer, we will be selling our trading position just when they shift back to the bullish side, quite possibly even more bullish than they were at the all time top, only to be whipsawed again as the next most devastating decline completely destroys values. To survive and thrive in the market between now and the time you hang it up as an investor you are going to need to separate yourself from conventional thinking. I had to do this fifty years ago. I suffered a great deal and so did my clients in the late sixties and early seventies when I was a young broker during a bear market of much smaller degree of trend than the one now underway. An investor should take ownership of his own destiny by understanding how markets work and following the probabilistic forecasts of practitioners of the Socionomic Theory of Finance. The very best socionomists, in my view, are the developers of the theory, Robert Prechter and his associates at Elliott Wave International. I began writing essays some time ago to provide my family and some friends a resource for their decision making. I will continue to do this, but I’ll be eighty in April. I don’t yet feel like I’ve lived past my sell-by date yet, but you never know. The best, and only advice I can give is that you give the folks at Elliott Wave International a call (800-336-1618) and get yourself a subscription to The Elliott Wave Financial Forecast. A year or so ago I wrote an essay about the theory and its development. The folks at EWI edited it so I know I’m giving you good information. To read it, click on the link below. made–and sometimes more, in the readjustment that inevitably follows. I’m writing this piece as the Dow Jones Industrial Average appears to be close to completing a small degree correction (wave 2), after falling in bear market wave 1 some 2,000 points from its high of 29,951 reached October 3, 11 trading days ago. 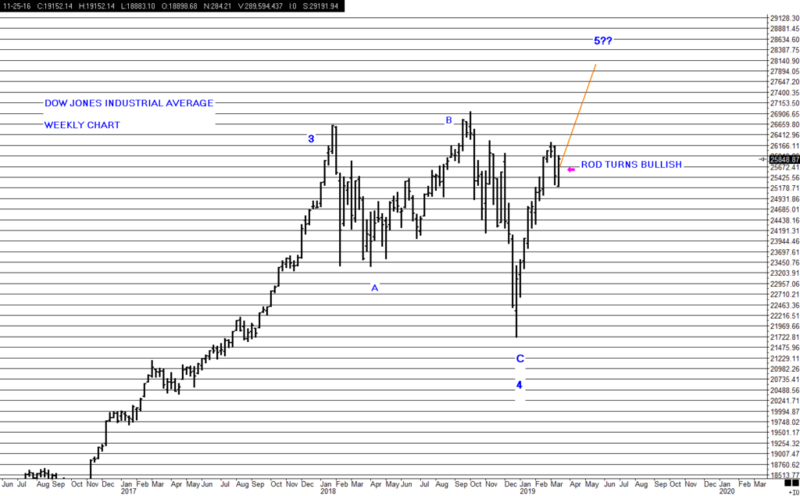 When this corrective wave is complete, wave 3 down gets underway, and it should be larger and more violent that wave 1. This morning a friend said, “I know you’re not surprised by the drop, but the market’s gonna go up.” His opinion is in line with everyone else’s. The first drop took place between mid October and the first week in November. The Dow fell from its high of 386.40, to 193.20, exactly 50% in about 3 weeks. From there, the market rallied into a recovery high of 303.90 reached in April 1930. From then, the Dow fell 89% to a low of 41 in May 1932. Will this happen again? We should be prepared for it. Why? Because this is what the analysts at Elliott Wave International have as the most likely market outlook dead ahead. In forecasting, it is generally agreed that anything can happen, but I would be loathe to dismiss this one. A few months ago I posted an essay on Facebook. I won’t do that again because it will be no help to anyone who has not been thinking about this for a while. Unless someone has prepared for a crash, they will want to know what is going to make it happen, and it’s too late for that. Either you’re prepared, or you cannot believe anything I say about it. It just doesn’t make sense to the crowd and the crowd’s advisors. I am prepared for the Dow Industrials to crash to 13,000 or below by election day. It has never been my objective in these essays to call the top of a bull market. It matters not if I managed that if I didn’t have the proper frame of mind to take action well before the turn actually happens. The hardest, most mentally debilitating period lies ahead for the vast majority of investors. This little break will not disturb them. In fact, If we go up a few hundred Dow points over the next few sessions, they will relax, “knowing” that the drop was a normal “healthy” setback. Then comes a bigger drop, one that takes the Dow down below 20,000. They will have a bit of discomfort, but their advisor will make them feel better by trotting out reasons why they should be at ease. At about Dow 17,000 the average investor will despair. Now she begins to think about maybe selling some “when it goes back up.” It never does. Bear markets do not let investors who stayed to the end off the hook. I’ve been making the case, based on extensive evidence to be found in The Socionomic Theory of Finance, that this top is a Grand Supercycle top that will not bottom before it sees the Dow Jones Industrial Average decline to below 3,000-about 90% lower than it is today. Most investors, totally unprepared for this, will not get out until well below 13,000, if at all. There is no place to hide in the circumstance. All categories of assets, including real estate, commodities, stocks and bonds will be totally obliterated. And then there’s the matter of investment income. “That’s my retirement income,” he tells me. Is now, but won’t be if we have begun a Grand Supercycle Bear Market. Stocks will crash, and then there will be a depression which makes it impossible for companies to pay dividends. By the time the dividends are no longer there the stocks will hardly be worth selling. And bonds? Don’t get me started. On his deathbed, the Baron Von Rothschild is famously held to have said to his survivors, “Never buy bad bonds in a good market!” And, while the story is probably apocryphal, it is absolutely on target. Almost all bonds issued by anyone other than the U.S. Government will ultimately default in a depression that will come at a time when the global financial system, by any measure, is more leveraged that ever in history. I will never tell anyone what they should to do. I will tell you what we do: we hold one and two year Treasury Notes. We do not care that the interest rate is low. Rates are going to go up significantly in the crunch, because lenders will demand ever higher rates to compensate them for default risk. My heart goes out to anyone heavily invested in anything other that very short maturity T Notes and T Bills. Push comes to shove, and they might not be the best place to be, but it’s the best I can do for us. We will roll these forward until a bottom good enough to reinvest comes. The analysts at Elliott Wave International have been estimating that it should be here about 2021-22. I’m not gonna lie, I don’t know if the DJI topped today, or has another 300-500 points rally left before making its final top. What I do know is that the season is ripe for investors to pay a large price for their misplaced confidence in the stock market. Robert Prechter, who is not given to hyperbole, Wrote this for an opening sentence on yesterday’s issue of The Elliott Wave Theorist: Breathtakingly precarious conditions in the financial markets have prompted me to publish earlier than usual this month. To understand how historically risky things are, we will examine the positions of four major financial market sectors: commodities, bonds, real estate and stocks, and how they relate to each other. If Prechter and his team of socionomists’ analysis is on target, the next 3-4 years will be brutal in the economy, and in all markets. The Dow Jones Industrial Average made a new high today. It is the last of the major averages to do so. 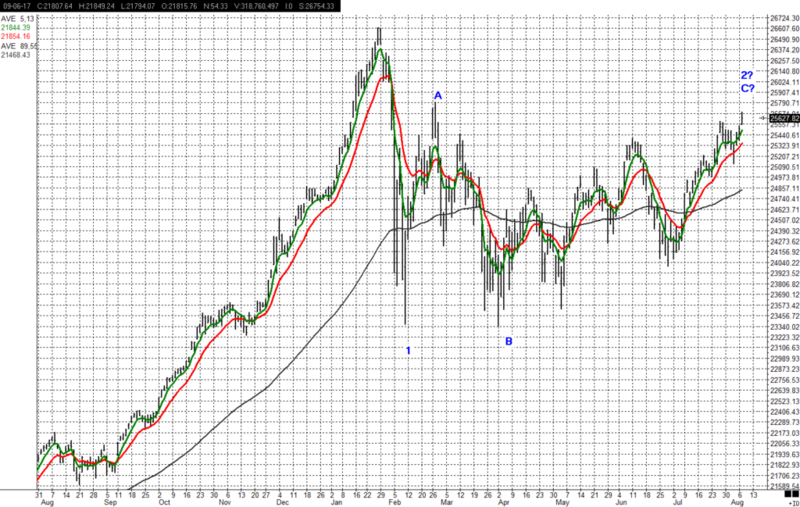 In this respect, it follows the pattern of the 1929 top. Frederick Lewis Allen wrote, “At the end, it was the generals marching by themselves, the troops having abandoned the front long since.” The Elliott Wave pattern allows for some more rally, but it is not necessary. The breadth of the market has been extremely narrow most of this year. Two stocks, Amazon and Apple have accounted for 32% of the advance in the S&P 500 since March. It’s a very unhealthy market, and quite typical of the condition that precedes a crash. Stock market valuations have never been higher. 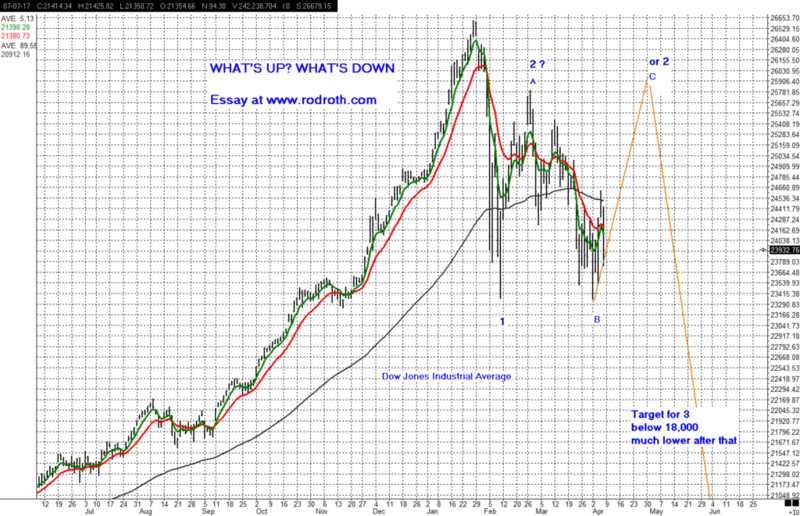 Nor has optimism, nor have bullish predictions been more extreme (Dow 100,000, is one of them). What shakes me up the most is the popularity of high yield (junk) bonds. Demand for them is so insatiable that they’ve been bid up to the point where there is little difference in yield between junk bonds and U.S. Treasury bonds. This situation is the best predictor of an economic depression that I know of. Mike Tyson said everyone has a plan until they get punched in the mouth. Fully invested stock investors won’t believe it, but they’re about to get sucker punched. October is not a good month for stocks, generally, and overvalued markets have a history of crashing in October-November. I wish my readers good luck and safety in the period ahead.